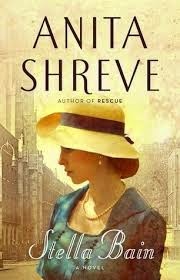 Anita Shreve is the bestselling author of 17 novels, including The Pilot's Wife, Rescue, and her most recent, Stella Bain. She is based in New England. Q: How did you come up with the idea for your most recent novel, Stella Bain, and how did you research it? A: I had the idea for Stella when I realized that a character from a previous novel had never really gotten to have her say. Then I realized the time period I would be dealing with would be WW1, a very large canvas. I researched the book by spending time in London at various libraries and museums, by reading, and by going back to reports written by original sources in 1919 and in 1920, right after the war. Q: You've written present-day novels as well as works set in various historical time periods. Do you have a favorite time period to write about? A: I suppose I'd have to say the past is my favorite time period due to the more fluid prose allowed and the wealth of stories one can unearth. Q: When you begin writing a novel, do you know how it will end, or do you change the plot as you write? A: Sometimes I think I know how a book will end, but I'm more and more surprised by how often I am wrong about that. I don't use as rigid an outline as I used to.